What made you become a hockey fan? I became a hockey fan when my best friend Beth took me to a Bruins game. Her roommate worked for the Bruins, so we had seats that were above the nosebleeds. Besides seeing how dusty it is on the top of the scoreboard, what fascinated me the most was seeing the plays develop. I got to see a few more Bruins games from time to time, interspersed with IceCats games. The rest, as they say, is history. What are you most excited about for the Railers HC? I am most excited about being a Member – that this is going to be MY team. What is going to help me pass the time between now and October 2017 is lots of work with the Booster Club and our volunteer work along with the front office of the Railers. It will be here before we know it! 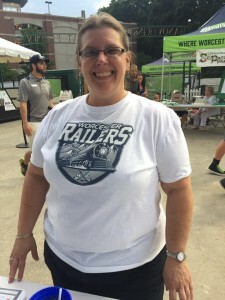 What would you like to see different from past Worcester hockey teams with the Railers? What I hope to see that is different with the Railers as opposed to the previous Worcester teams is the depth of the fan experience. From the get-go, the vibe from Cliff, Toby and Mike has been completely different from the past front offices – in a very, very, very (or wicked!) good way. What was your thought on seeing the Railers Mascot and what were you expecting? My first thought at seeing our Mascot, Whats-His-Name, is “YES!! !” I wasn’t sure what I was expecting, but the reality is wicked awesome, and I love it. I’ve already put in several suggestions for names.